No, this isn't an accidental re-post! Not everyone celebrates the beginning of a new year on 1 January. The school year begins in September, the financial one in April, Islamic new year is not until August, Jewish Rosh Hashanah falls in September this year and for the Chinese regardless of chosen religion it's today. If you're regretting giving up those Resolutions last month perhaps now's the time to give it another go now that we're heading into spring - Saturday was Candlemas which some people deem the change of seasons - and the days are brighter, longer and warmer (not sure about that one today!) meaning that your resolutions should need less will power and making them easier to achieve. On the Chinese calendar we've just entered the year of the Pig or Boar which is supposed to be an auspicious year because the Pig attracts success in all the spheres of life, this year is an earth pig so I recommend planting lots of lovely seeds for a successful harvest of flowers and vegetables! 2018 was the year of the dog and that was the theme of our CJS passwords throughout the year, read a bit more about that in this blog post here. 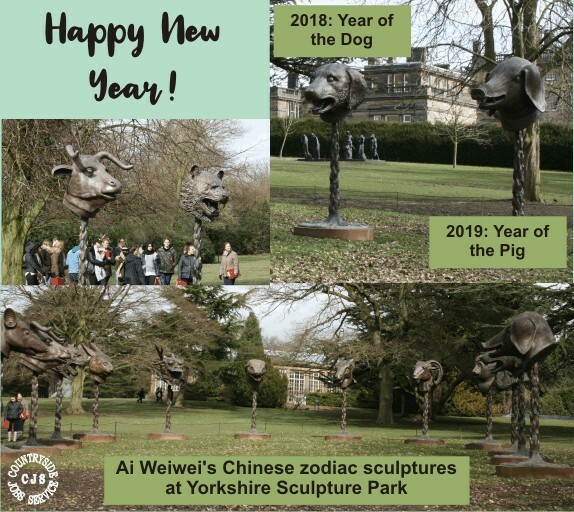 Last March I had some time to waste whilst office dog Flora was in surgery in Wakefield so I headed off to the Yorkshire Sculpture Park just down the road and was lucky enough to see Ai Weiwei's Chinese zodiac sculptures. The massive bronze heads were very impressive, 12 animals in a horseshoe arrangement, each one representing a year in the calendar. Unfortunately it was very muddy and although the area immediately around the sculptures was cordoned off you could still get quite close to see the fine detail. They've travelled around the world ad will stay in Yorkshire until 10 June so if you're in the area call in and see them. Aw cute bunnies, puppies and little kittens.